Big on fun, big on yum! Our party-ready fruit arrangement is filled with a mouthwatering mix made for sharing: dipped strawberries rolled in colorful confetti sprinkles, plump grapes, melon and more. 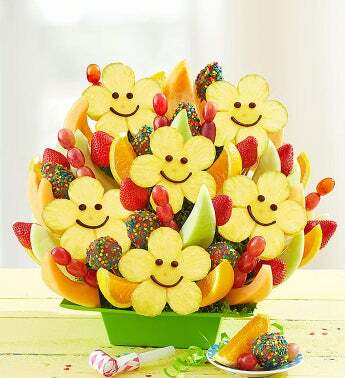 And to really get everybody smiling, we’ve added happy face pineapples shaped like adorable daisies.